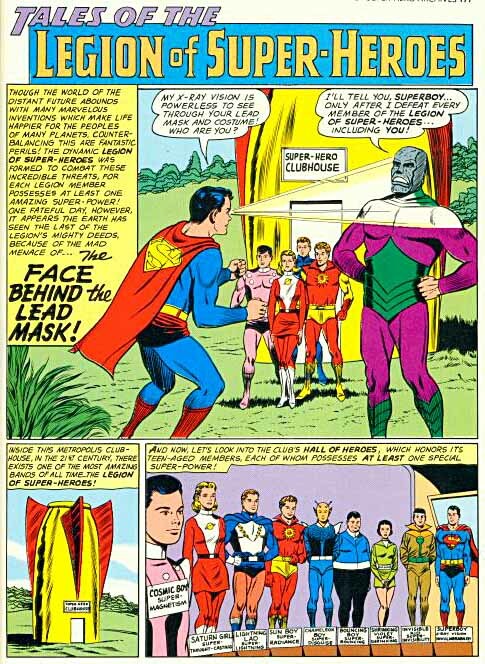 It began as just another Superboy story written by Otto Binder, art by Al Plastino, about a super-team of super-teens from the far future. The cover of ADVENTURE COMICS #247, April 1958, featured the name for the first time in the lettering of DC staffer Ira Schnapp, who also designed the attractive logo. 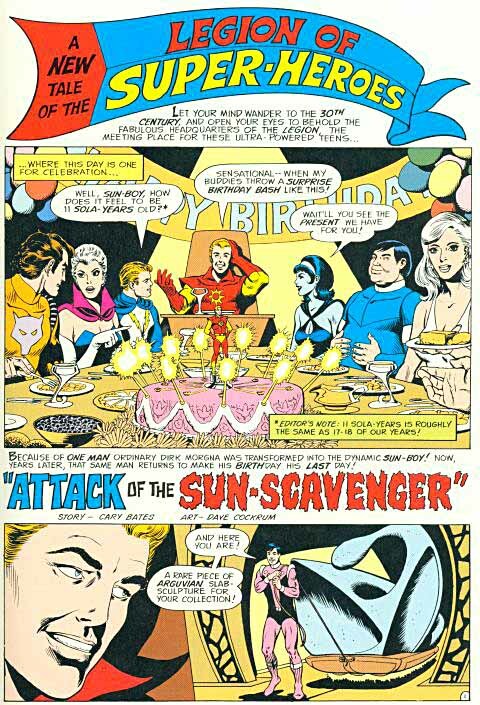 “The Legion of Super-Heroes,” was a bit of a mouthful, but conjured up a winning combination of a super-club that thought Superboy’s powers were nothing much! The name is in Schnapp’s familiar cover-title style, like nearly every DC cover from about 1950 to 1968, and is not yet anything like a logo. The lead story inside had the group’s name again, this time in open letters, as done by whoever lettered this story (and there were no credits for letterers then, so that person is unknown to me.) The word LEGION has been given some emphasis, with squared corners, but again, this is not a logo. Sure, many times in DC’s history a slightly fancy character name in a story title became a logo by default, but not this time. No one at DC even knew the characters would be back, but the response by readers was very positive. 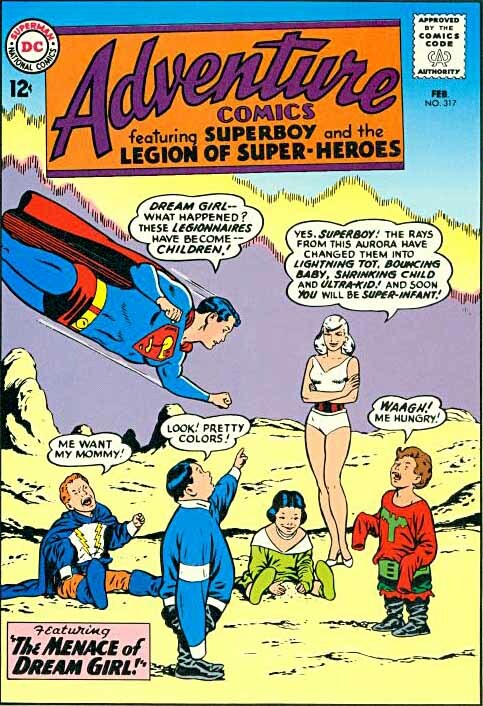 It took until issue 267, a year and a half later, for the Legion to return in a series of stories written mainly by Jerry Siegel (co-creator of Superman, of course), in ADVENTURE, ACTION, SUPERBOY and SUPERMAN before the Legion gained a permanent home. That happened in ADVENTURE 300, Sept. 1962, where the group’s name was once more rendered in the same cover style by Ira Schnapp. There was one difference: it was “TALES OF,” indicating a series. And on the title page of that lead story the Legion at last had their own logo. Clearly designed by Ira Schnapp, the top line, TALES OF THE is in the same style as his cover title lettering, but with open letters. The rest is tall, condensed block letters with taller initials, and all caps except OF. The problem of a very long name was already present, and Schnapp’s solution worked well. A box around the group name helped set it apart from the art, and made for better color options. The letters have small serifs, adding interest, but like most of Schnapp’s logos, it’s pretty staid and conservative. I like it all the same. This logo appeared on all the ADVENTURE Legion stories, and reappeared on some later ones as well. 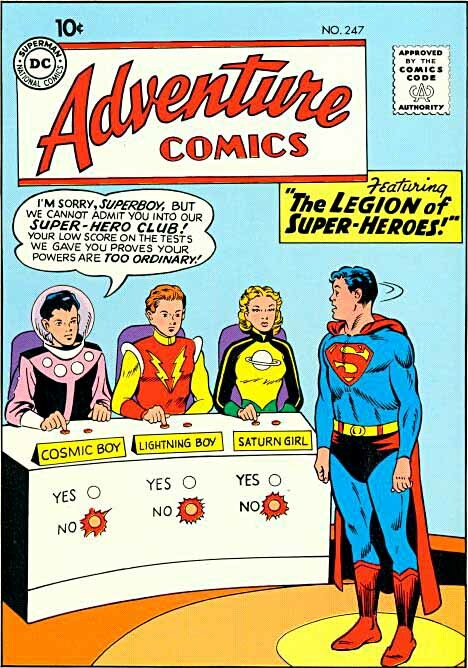 Beginning with issue 317 the League’s name was added to the ADVENTURE logo box, along with Superboy. Ira Schnapp did a good job of making it all work, despite having to create a comic book logo ten words long! Fortunately, the box meant the letters could be solid black, not outlined, which would have been really hard to read, I think. The style is another Schnapp favorite, very classic sans-serif block letters. Again, conservative, but since he was doing all the lettering on the covers, it works together well. The Legion chugged along in ADVENTURE and elsewhere, continuing to grow in popularity. A noteable writer was Jim Shooter, who sold his first story at age 15 and became the regular writer for a while. 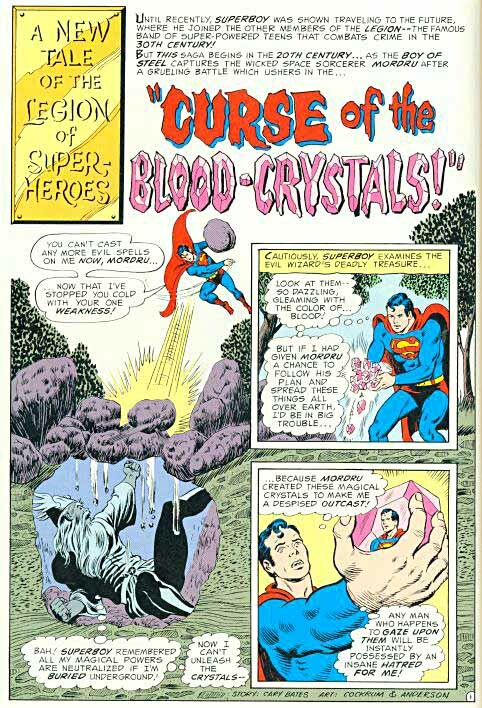 Among the artists, Curt Swan’s work was always excellent. It wasn’t until issue 403, April 1971, that the group finally got a real cover logo. The logo, and all the cover lettering, is by Gaspar Saladino, who had by this time succeeded Schnapp as DC’s main guy for logos and covers. Here’s a photocopy of the logo from the DC files. There’s one main difference from the final version on the cover: the word OF was redone to match THE after this version was lettered. I’m actually not sure this is the way it looked when Gaspar did it, either. In the printed version, there are inner solid shapes held in red. Those were probably part of the lettered logo, but for some reason were dropped out of this copy. (They might have been added to the logo on the cover itself.) This is pretty conservative for Gaspar, so perhaps he was looking back to what Schnapp had done for his direction. And there are only so many ways to go with such a long name, too. Tall, condensed letters are almost necessary. There are a few hints of Gaspar style in the angled stroke ends that give the logo at least a little bounce. I believe it only appeared this once. 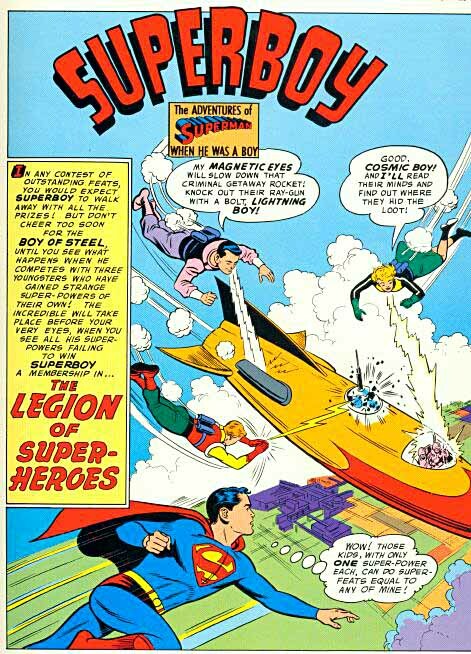 One month earlier, the Legion had already moved into Superboy’s own title for another lengthy run, making way in ADVENTURE for Supergirl. 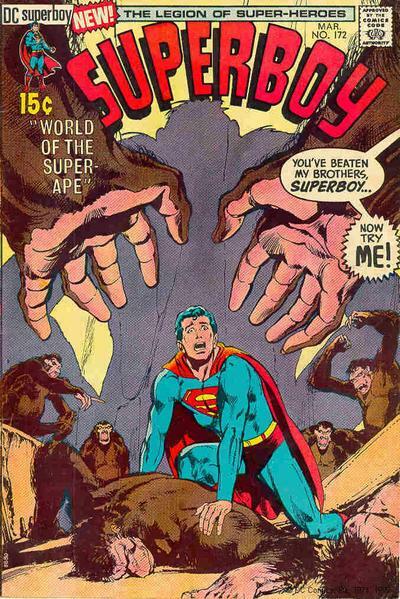 SUPERBOY still had the original Ira Schnapp logo created for its first issue, looking a little dated now, and the Legion got only a “NEW!” and a line of type at the top of this nice Neal Adams cover. I’m sure the fans took note, though. E. Nelson Bridwell had been writing the stories, but a new, younger generation was coming aboard: writer Cary Bates and artist Dave Cockrum, who started with issue 173, and brought new life into the feature. 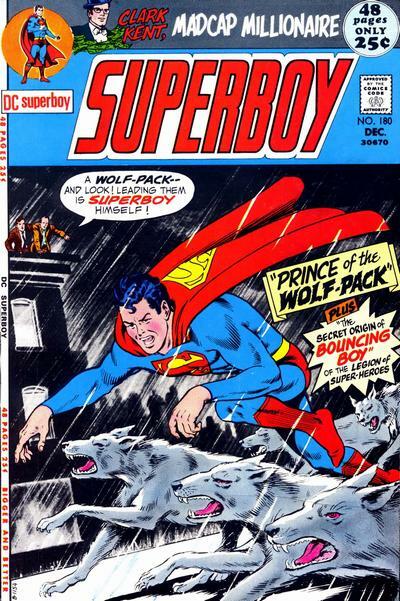 With issue 180, December 1971, SUPERBOY gained a new logo by Gaspar Saladino that would later set the style for a new Legion one as well. Again, it’s pretty conservative for Gaspar, but the straight-across design and tightly condensed letters allowed the name to appear larger on the cover than the previous logo, while taking less space, and working better with the rest of the trade dress and cover lettering. An outer line created a shape for a second color, and the blue banner could have been eliminated. The Legion is still just getting third billing on Gaspar’s cover lettering. 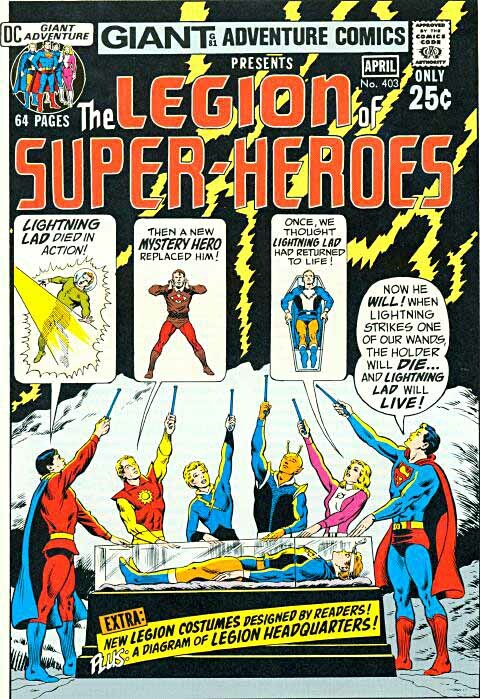 By issue 183, March 1972, the Legion was getting more attention, and the SUPERBOY logo had been moved up to give a little more room for cover art. Inside the book, the old Ira Schnapp story logo was still present, but given an extra NEW in a slightly different topline. …and here a banner that suggests a college team flag. Both these new story logos are by letterer Ben Oda, and show his talent for loose but pleasing shapes. Ben did most of his titles freehand, rarely picking up a ruler or straightedge. He also lettered the rest of these pages, and was one of the busiest letterers at DC through the 70s and until his death in 1984. These story logos were used along with the Schnapp one for a while, but the Legion was about to get some new cover logos in 1973, and thereafter the stories used those, too. We’ll continue there next time. Visit my LOGO LINKS page for more logo studies and information. This entry was posted in Logo Studies on October 5, 2009 by Todd. 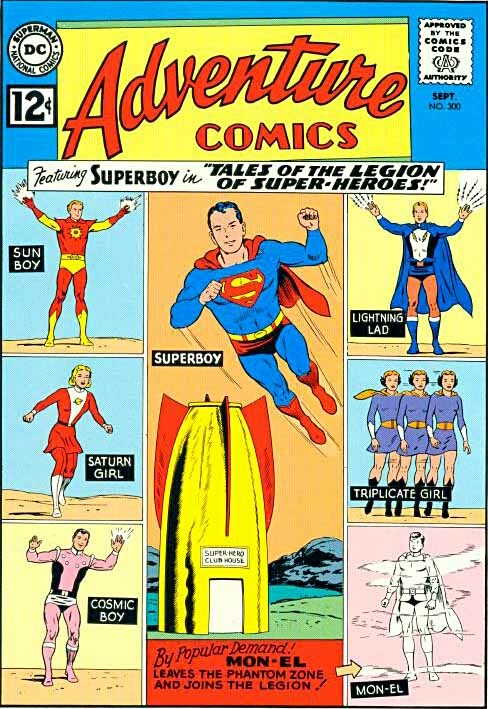 Huh, I recall some of the wonky logos of the Superboy era Legion, and I’d always assumed that they’d been created by Dave Cockrum rather than by the letterer. Somehow they feel very Cockrum-esque, especially given the intricate designs with numerous flourishes he created for the Legion members around this time. Of course, Cockrum and Oda may just have been of a similar mindset in their Legion work – certainly it was one of the most distinctive-looking series DC was publishing at the time. I wonder (just out of curiosity about how these things work) if the “Happy Birthday” banner in the last page was lettered by Cockrum or by Oda? Cockrum may well have laid out those logos in his pencils, I hadn’t thought of that. 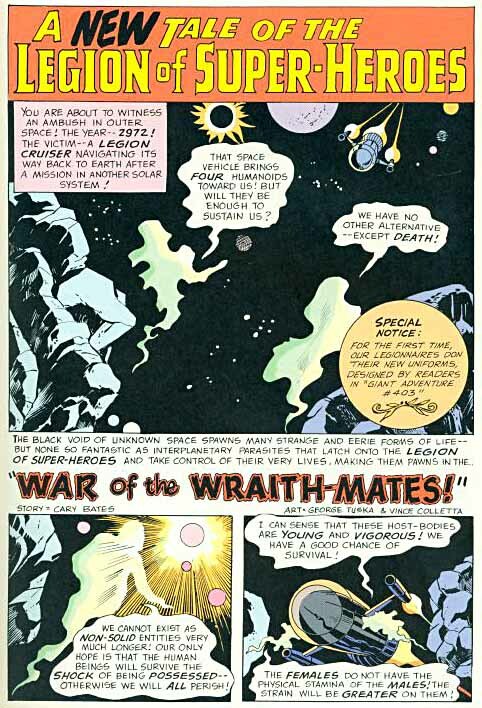 But the finished work of both the logos and story titles is clearly that of Ben Oda, who tended to do his own version of anything in the pencils anyway. The sign was also probably pencilled in by Cockrum and lettered by Oda. Great piece, as ever. 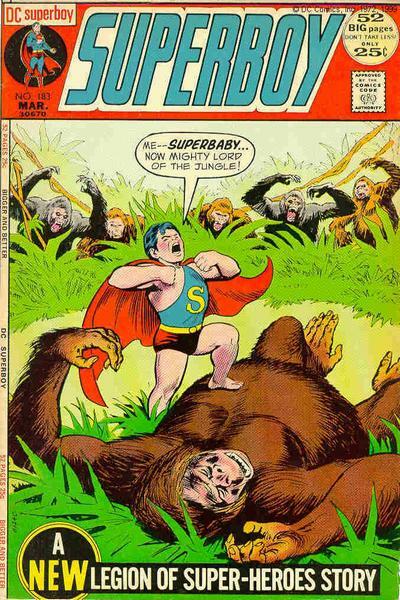 I love that original Superboy logo, though; it’s timeless to me.